Dubai, UAE, July 05, 2018: Carl F. Bucherer is expanding its successful Manero Flyback collection by adding a new retro-style version. The striking chronograph with flyback function is designed for sophisticates wanting to showcase a piece of the pinnacle of the art of Swiss watchmaking from Lucerne. The watch boasts surprising elements such as the bold yet subtle combination of colors on its stainless steel case with silver-colored totalizators, accents of red, and a golden brown kudu-leather strap. May 2018. 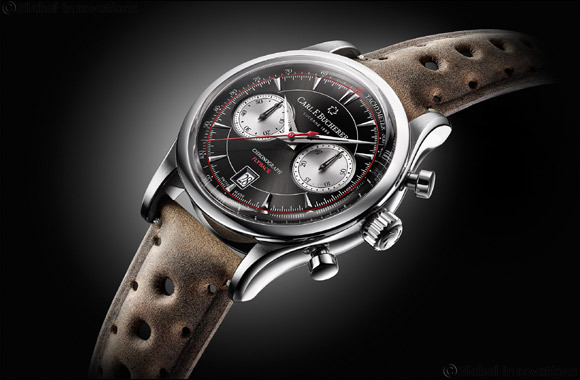 The retro style of the Manero Flyback family is highlighted even more with this new edition. Inspired by Carl F. Bucherer models from the 1960s and 1970s, the latest Manero Flyback features a bold yet subtle combination of colors in the form of a black dial with silver-colored totalizators. Fine touches of red complete the harmonious contrast. The retro style is continued even throughout the new-style strap. The suede finish of the golden brown kudu-leather strap gives it an extremely natural appearance while ensuring optimum comfort for the wearer. The impressive timepiece houses the intricate CFB 1970 chronograph caliber featuring the namesake flyback function. Strongly committed to embracing its rich heritage, Carl F. Bucherer launched a global campaign last year featuring the slogan “Wherever time takes you, Lucerne travels with you.” Those with a truly global network who feel at home around the world value the Manero Flyback as a stylish ambassador of the city of Lucerne – a little piece of home that accompanies them wherever they go. Another version featuring exciting contrasting colors in a subtle stainless steel case is now joining the six unique luxury watches in the Manero Flyback collection. The deep black dial gleams with a sunburst finish, while the recessed, matte silver small-seconds and stop minute subdials at 3 and 9 o'clock provide a striking contrast. Lancet-shaped, polished steel-colored hands that correspond to the appliqu�d indices display hours and minutes. An additional unique attribute is the contrast of the red stop second hand and black small-seconds and minutes counter hands. The printed chapter ring and the tachymeter scale, which allows for speeds to be determined, are painted red and white. The new model's retro look is completed by a kudu-leather strap in golden brown with a suede finish. As with all the other members of the chronograph collection, the new timepiece shares the typical Manero family design vocabulary – it is classically round with a diameter of 43 millimeters, in line with current trends. The caliber of the Manero Flyback is the highly complex CFB 1970 chronograph, which can be admired through the see-through sapphire-crystal case back, oscillating at a frequency of 4 hertz or 28,800 beats per hour. This automatic movement boasts a power reserve of 42 hours and features a flyback function that allows for the recording of consecutive times in quick succession. The recording of short times operates via a thermally blued gear wheel. Time may be fast moving for people who travel the world professionally and privately, but wherever they go, they always have a piece of the pinnacle of the art of Swiss watchmaking from Lucerne on their wrist with a Manero Flyback.